See more objects with the tag artists, collectors, figures, art, fellow academicians, women, cushions, information, costume, print collectors, Turkey, fur, parade, cloak, turbans, rugs. See more objects with the color lightgrey darkgrey darkslategrey dimgrey grey or see all the colors for this object. This is a Print. It was created by Joseph Marie Vien the Elder and etched by Joseph Marie Vien the Elder. It is dated 1748 and we acquired it in 1962. Its medium is black ink on cream laid paper. It is a part of the Drawings, Prints, and Graphic Design department. In preparation for the festivities of Carnival in 1748, a group of students at the French Academy in Rome devised to dress collectively as Turkish men traveling in a sultan’s caravan to Mecca. The pensionnaires crafted homemade costumes, painting linen to resemble sumptuous brocades and hung oversized turbans with faux pearls and feathers. The fantastic outfits were modeled after sets of prints illustrating figures in exotic dress, including Bonnarts’ Costumes du règne de Louis XIV, and Vanmour’s Recueil. 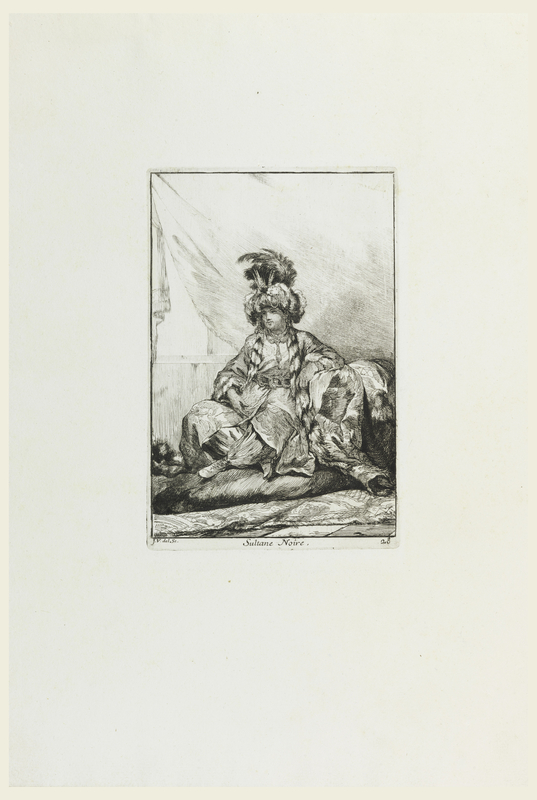 Images of people living in the Ottoman Empire were popular in France; two years before Vien’s departure for Rome, the embassy of Mahmen Said Effendi visited the French capital, igniting the fashion for turquerie. 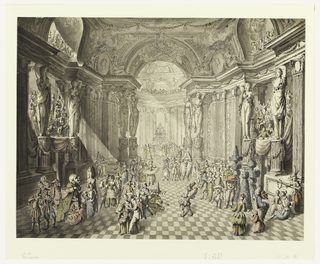 Joseph-Marie Vien had a tremendous aptitude for etching, demonstrated by the ambitious set of thirty-two plates he made to record the student’s masquerade costumes. He created the etchings by using a metal stylus to draw onto the surface of a copper plate that had been covered in a preparatory ground. The plate was then immersed in acid, which corroded the areas of metal left exposed by the tool’s marks. The result was a richly textured image with the spontaneous lines of a drawing that could be produced in multiples. Etchings were an affordable way for artists to distribute their work and build their reputation. This object was purchased from James J. Kane. It is credited Museum purchase through gift of Eleanor G. Hewitt. Inscribed across lower margin: Sultane Noire; J.V. del. Sc.